The temperature is soaring in the capital and with so much to do on your list, staying indoors isn’t an option. The sun doesn’t only bring scorching heat but also causes irreparable damage to your skin. Here’s a list of tried-and-tested sunscreens you should consider investing in. This one is a personal favourite. It protects your skin from the sun and saves you from all that tanning, providing an effective cover against all sun radiation (short and long UVB-UVA). Dermalogica products are recommended by a lot of skin specialists. This one especially works well for sensitive skin that’s easily prone to sun damage. It’s formulated with nourishing botanicals and anti-ageing actives, so there isn’t only sun protection, but also skin rejuvenation. This sunscreen doesn’t leave that extra sheet of oil on your face and also saves it from darkening, sunburns and age spots. Definitely one of the best sunscreens available in the market. Vichy promises and also delivers non-sticky protection from premature and environmental ageing. It’s extremely lightweight and offers full coverage, making it perfect to have on through the day. This 100% mineral-based anti-wrinkle sunscreen with SPF 50 is a keeper. It’s perfect for sensitive and acne-prone skin. It’s infused with antioxidant-powered Vitamin E which helps fight the effects of damaging radicals. It is fragrance, paraben and chemical filter free. SPF tested and based on the COLIPA’s sunscreen products recommendation, this sunscreen works wonders when it comes to the harsh sun. It’s good for all skin types, so don’t stress about damaging your skin. With its brilliant UVA/UVB protective activity, Bioderma offers real internal biological protection. This exclusive patent preserves and stimulates the skin’s defences (immunity) during sun exposure. This sunscreen is gentle and perfect for dry heat. It helps nourish your skin and also provides protection from ultraviolet radiations, sunburns, and other conditions. It battles the effects of the harsh sun in addition to providing radiant skin and preventing wrinkles. It leaves your skin feeling smooth and moisturised, making it perfect for everyday use and outdoor activities. Clinique always comes out with amazing products for skincare and this mineral sunscreen is one of them. With a high-level UVA & UVB protectant with antioxidant repair and 100% fragrance-free like all Clinique products, this one is a must in your vanity kit. It’s a non-chemical daily-use sunscreen that provides full-spectrum sun protection and a boost of hydration to keep skin healthy and even-toned. The best part? It’s all made using natural ingredients. Renowned for its brightening properties, the benefits of Vitamin C for skincare are unbeatable. 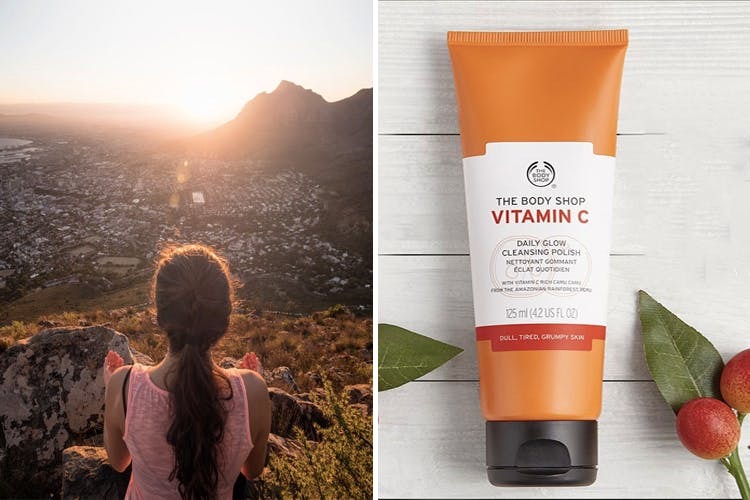 The Body Shop Vitam C Glow protect lotion contains natural Camu Camu berry with 20 times more Vitamin C than an orange, apparently.